Saturday, April 27 and Sunday, April 28 at 2:00 p.m.
Tickets can be purchased online at www.j-hawks.com/tickets Tickets can also be purchased one hour prior to showtime outside the UHS Performing Arts Center. This musical comedy is fun for all ages so bring the whole family for a night of laughs, entertainment, and a heartwarming story about loving those around us. 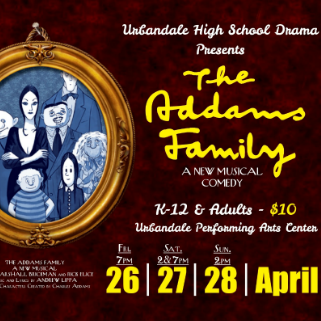 The Addams Family musical takes you inside the funny, kooky, upside-down world of the Addams Family! There, to be sad is to be happy, to feel pain is to feel joy, and suffering is the stuff of dreams. 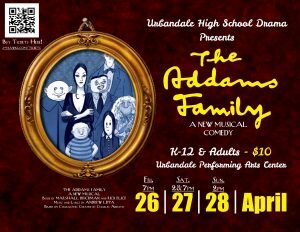 Nonetheless, this quirky family still has to deal with many of the same challenges faced by any other family: the Addams kids are growing up! The Addams family has lived by their unique values for hundreds of years and Gomez and Morticia, the patriarch and matriarch of the clan, would be only too happy to continue living that way. Their beloved daughter; however, is now an eighteen year-old young woman who is ready for a life of her own. She has fallen in love with Lucas Beineke, a sweet, smart boy from a normal, respectable Ohio family — the most un-Addams Family sounding person out there! And to make matters worse, she has invited the Beinekes to their home for dinner. 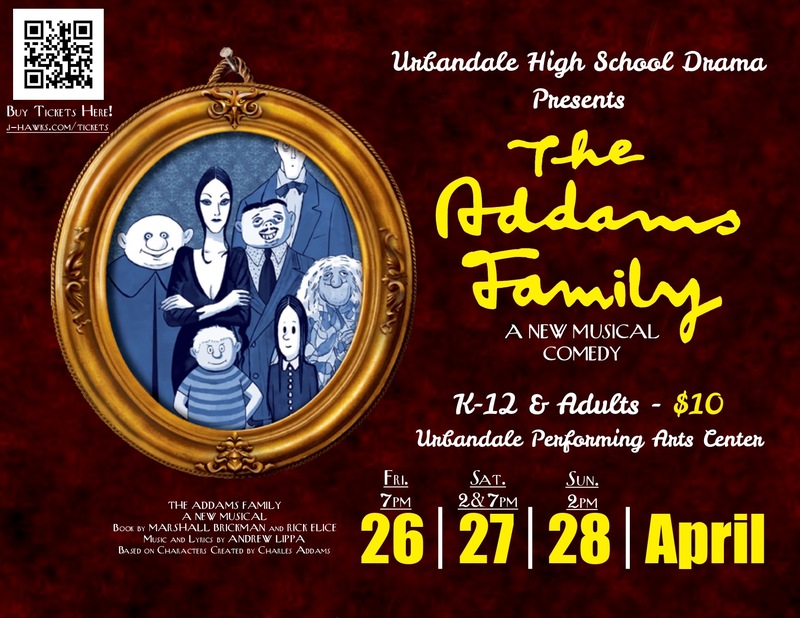 In one fateful, hilarious night, secrets are disclosed, relationships are tested, and the Addams family must face up to the one horrible thing they’ve managed to avoid for generations: change. This musical comedy is fun for all ages so bring the whole family for a night of laughs, entertainment, and a heartwarming story about loving those around us. 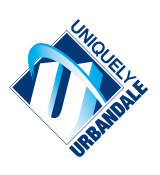 Audience members will also be able to learn about the “U MATTER” initiative that the drama department has formed with Urbandale Middle School to raise awareness about acceptance, inclusion, and anti-bullying. The audience will be given the opportunity to support this initiative at the “U MATTER” booth in the hallway outside the theatre through a freewill donation, or by taking part in the silent auction. The organization has already touched hundreds of youth in the community so far this year by producing educational skits, videos, and performances.